A few weeks ago I was talking with friends, and announced that I wanted to write a book that asks (and answers!) the questions: why is it that secular society seems to find the best answers to big moral and ethical questions so much sooner than the world's great religions? Why is it that secular society is, more often than not, ahead of religion in figuring out pressing moral issues? It seems to me that over the last several centuries, secular society, not religion, led the way in toppling monarchies and starting participatory democracies, abolishing slavery, and granting women the right to vote. Today it is once again secular society (and even corporations! ), not religion, that is leading the way to granting equal rights to people who are lesbian, gay, bisexual or transgender. In each case there were religious supporters of these positions (democracy, abolitionism, universal suffrage). But for the most part, my understanding is that these were secular movements that influenced religion, not the other way around. The only counterpoint to these examples is the civil rights movement in the 1950s and 1960s where the religious community (as led by Dr. King) was out front on the issue of ending Jim Crow laws and insuring that African Americans had the right to vote and go to school and participate fully in society. I imagined that it would take years of research to answer these questions satisfactorily. 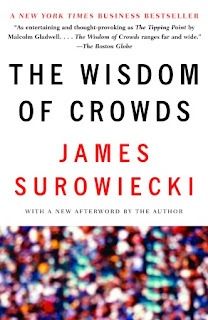 But just this week I picked up The Wisdom of Crowds by New Yorker business columnist James Surowiecki and it is absolutely brilliant. The classic example is to ask a crowd of people (say, at a state fair) to judge how many marbles are in a jar, or how much an ox weighs. The average of all of the guesses from the crowd will tend to be more accurate than the guesses of even the best experts. But it's not just true in connection with guessing the number of marbles in a jar. It's also true of stock market mutual funds. Groups don't always reach the best answer. Depending on how they are set up, groups can lead to a dumbing down or a lowest common denominator solution rather than excellence. According to Surowiecki, in order for a group to be smarter than the experts it needs 3 things--diversity, independence, and decentralization. Diversity brings in new ideas, independence insures that those new ideas get expressed, and decentralization prevents the sort of small minded group think that can lead a herd over a cliff. Diverse teams come up with better answers than homogeneous teams, diverse nations are stronger than homogeneous nations, and Google is smarter than the world's smartest man. Which brings us back to our original question. Why is it that secular society seems better than religion at addressing the biggest moral and ethical issues of the day? Because secular society, if set up properly, has all of the features of smart groups--diversity, independence, and decentralization. If a society is set up properly, it also has avenues for aggregating these opinions (e.g. elections). Religions, it should be noted, tend to be characterized by all the factors that makes groups less able to come up with good answers--they tend to be homogeneous, hierarchical, and centralized, and lack both the mechanisms and the will to aggregate the opinions of a broad swath of people. The Wisdom of Crowds also explains why the Iraq war is such a disaster, which I'll explain in a subsequent post.